To develop our website, we auditioned several website designers, including some established (and expensive) firms, before deciding to go with Fat Graphics. We're extremely pleased we did. James Loudon did a fantastic job, within rapid timescales and (modest) budget. I cannot stress how difficult it is to develop a simple, clear, easy-to-understand-and-navigate commercial website, which is exactly what James came up with. We often get complimented on the quality of our website, and many customers say that our website design was a deciding factor in purchasing from us. In addition, James has always been there when we needed him since we began over six years ago. Unequivocally and highly recommended. ﻿Our website is regularly complimented by customers, the majority of whom are young and very web-savvy. We are totally confident in what Fat Graphics do for us. They are quick to respond to our requirements, jargon-free and understand what we need. Areas include retail, PR, educational resources, engineering, music and arts. Some examples are shown below. Pirates of the Carabina - contemporary circus company. 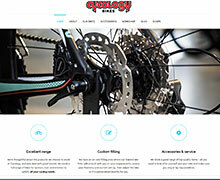 Website built with responsive HTML5 with a Perch content management system for full client control. An award winning artist based in Bath Richard produces unique paintings. 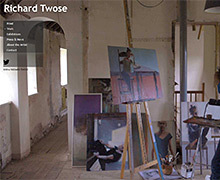 His site is fully responsive gallery and information base with content management built in. 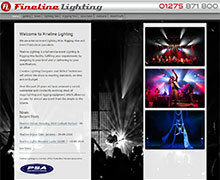 Fineline Lighting is one of the leading independent Lighting & Rigging companies in the UK. The site is built with an open source CMS system with blog and multiple galleries. 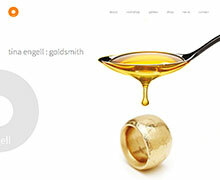 Tina Engell is a specialist goldsmith and jewellery maker in Bath. The site is designed to show off her unique creations in a clean and dynamic fashion. 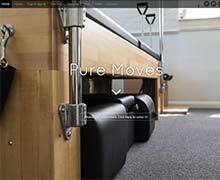 Pure Moves is a Pilates and holistic health centre in Frome. We manage this large and busy site and keep it updated with fresh content and photos. Built using a responsive WordPress framework. 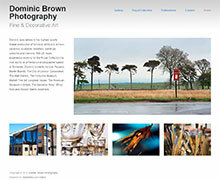 Fine art and landscape photographer. His new website was built on a modern Wordpress template to be as fast and clean as possible. 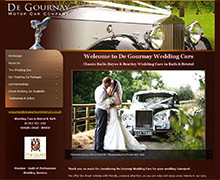 De Gournay Motor Car Company - one of our longest established clients, based in Bristol they provide classic Rolls Royce and Bentley wedding cars. The site features many slideshows of the cars at wedding venues. Cycology Bikes have shops in Frome and Chippenham. The site features Pulse content management. 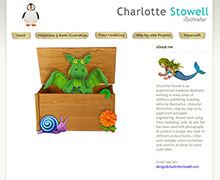 Charlotte Stowell is an established illustrator and model maker for childrens books. Accordingly the site is almost entirely graphic based with CSS galleries of her work. Yoga Frome is the new peronal site for Lois Shilton, an Iyengar Yoga teacher based in Somerset. The site features a simple CMS framework and very clean code. 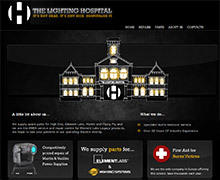 The Lighting Hospital is the only independent service department for the Lighting Industry in Europe. Built in content management and online shop. 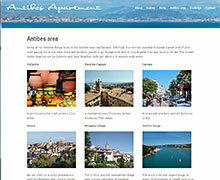 Showcase site for an apartment on the Côte d'Azur featuring easy to use CMS, galleries and live availibility calender. 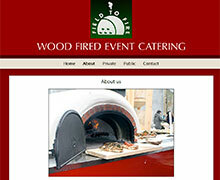 Field and Fire are a Wiltshire based mobile catering company specialising in very tasty wood fired cuisine. They cater to all kinds of public and private events. The site is built using the latest open sourse Pulse framework. 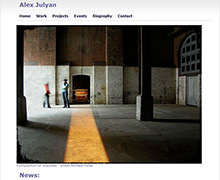 Alex Julyan - artist, sculptor, model and mask maker. We shot and edited some of the content on the site and built it all into a simple CMS framework built on modern and simple code. 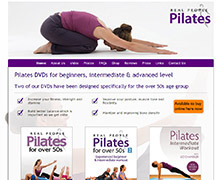 Real People Pilates produces Pilates instructional DVDs. We manage the website and online shop and also provided production services for the video shoot and edited the audio content.